A modest day out saw 10yo, 13yo and I head into Leeds. Taking the rear exit from the station into Granary Wharf we eventually found where the water taxi departs from. Unfortunately we were 13th-15th in the queue for a boat with a capacity of 12, but given we'd made it that far we waited half an hour for the next trip. While we were there a canal barge pulled up to access Lock #1 of the Leeds-Liverpool Canal so we had that to entertain us. 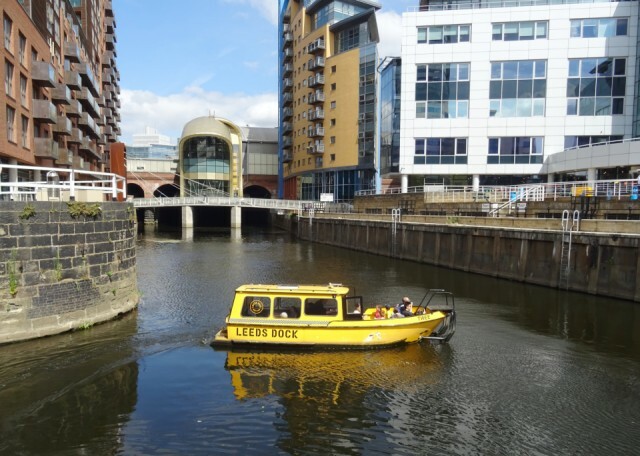 The ride down to Leeds Dock only takes 10-15 minutes, but it did make a nice way of viewing that bit of Leeds, and the swallows that were hawking over the water. On arrival we negotiated the lock bridges to get onto Fearn Island where we picnicked, then it was back onto the mainland for a visit to the Royal Armouries Museum. Of all the museums locally this is the most tedious from a kids point of view and I do find the whole venture problematic but in small doses it can divert for a little while and of course there are things to be learned. Having watched Black Panther with 13yo a couple of nights ago he was able to identify that artifacts on display may well be loot although we didn't find anything from Wakanda. We walked back up river to the station and now the kids are back at their Mum's. That's the end of this first mini-stint of summer holiday for me; we resume next week.